Lately, I’ve been tinkering in the kitchen, trying to come up with ideas on nutritious snacks for my husband and toddler. My latest concoction were these very tasty hazelnut buckwheat granola bars. They’re not only great as a snack, but also great bars for breakfast, if you prefer. These granola bars are a little on the soft and chewy side. At first I was aiming for crispy/crunchy, but was pleased with this softer version. The buckwheat provides a little crunch. 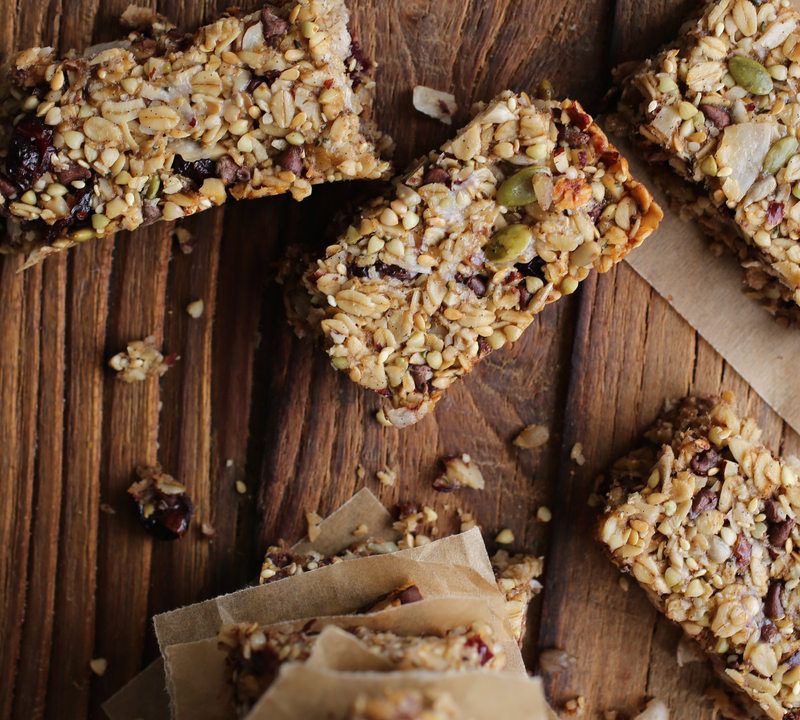 As you may already know, when it comes to homemade granola bars, you really have to play around with them to find the right combination of texture and flavors that work for you. Although easy to make, getting the right texture can be a bit tricky. What you want to do is look for a basic proportion of chunky things (nuts, seeds, dried fruit…) to the sticky things (sweeteners/syrups, oils…). I don’t always get it right, but what’s nice is that granola bars are often forgiving, allowing a great deal of flexibility and plenty of room for experimentation (a fun part!). Even if you don’t get the exact texture (chewy, crunchy, soft, etc) that you had in mind, it’s likely that they’ll still be tasty and edible. You can find creative ways to use them—break them in a bowl and pour milk over them for cereal, or use it to top warm porridge or yogurt, for example. I also like that you can really go to town with granola bars by adding a variety of nuts, seeds, grains/flakes and dried fruit combinations. I packed these granola bars with plenty of seeds—pumpkin, flax, sesame, sunflower and hemp seeds. They are all nutritional powerhouses! Feel free to adapt this recipe, changing the nuts or dried fruits to suit your preferences or what you have on hand. I’d love to hear how you like it and what mixes you come up with for your versions. The possibilities are endless! Preheat oven to 350F. Line a baking pan in one direction with parchment paper, allowing the paper to go up the opposing sides. Do the same in the opposite direction. This helps to remove the bars from the pan after they’re baked. In a separate bowl, combine the wet ingredients. Mash bananas with coconut oil, maple syrup and vanilla (scrape out seeds of vanilla bean). You can use a fork, blender or food processor to combine. Pour the wet ingredients over the dry mixture and stir them together until the dry ingredients are well coated. Spread batter evenly into prepared baking pan, pressing firmly into the bottom, edges, and corners. You want to make sure the batter molds to the shape of the pan. Use a plastic wrap (cling wrap) as you press so the batter doesn’t stick to your hands. Bake bars until they’re brown around the edges, about 30-40 minutes. Cool in the pan on a cooling rack or in the refrigerator. After about 25 minutes or so. Lift the tops of the parchment paper to remove the bars and allow to cool on the paper, but out of the pan. This speeds up the process a bit. These can be stored in the freezer in a plastic bag or an airtight container. Notes: A few notes, if you want them to be a little crispier, you can try baking them a little longer, or scale back a bit on one of the wet ingredients. Also, you can try roasting the flakes in the oven and allowing them to cool before combining with other ingredients. Thanks Nomzi, let me know if you try them! I hope you like them! Thanks for sharing! Do You do anything to the buckwheat first before mixing it in? Does that make sense? Thx! I sometimes soak buckwheat when making breakfast cereal or porridge, but I haven’t tried soaking them for granola bars. I’m not sure if it would be too gelatinous, perhaps. I could try though, sometime. Awesome! Thanks for letting me know. I definitely think you can lessen the amount of sweetener. Note, if you use agave it often tastes sweeter than the others. I’m planning to make these again this week, I’ll try with just 1/4 cup (or less) of sweetener. Thanks again! Now is the time! 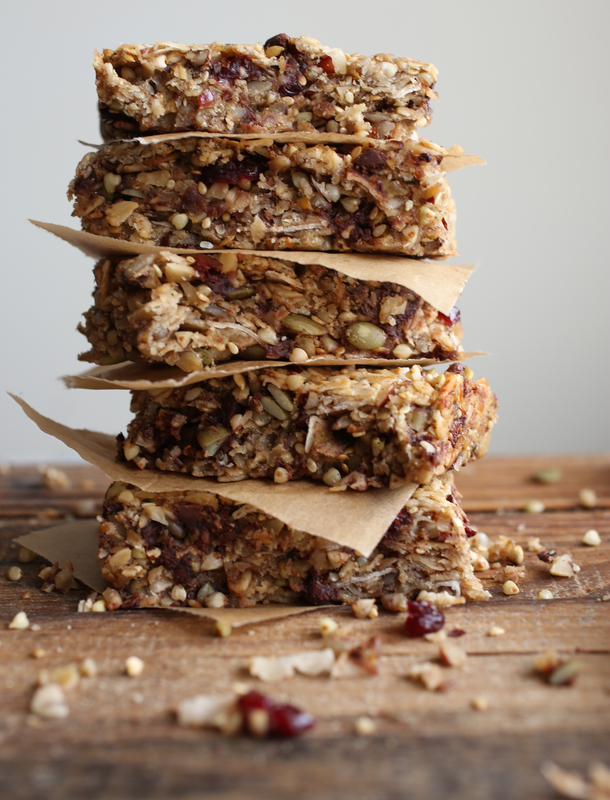 I’ve now posted two recipes for granola bars you can try!